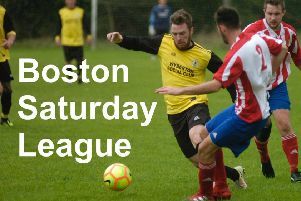 Coningsby FC hosted Skegness Town Reserves on Saturday for a rescheduled Boston League match. Only four minutes into the game, Coningsby were awarded a free kick and when the ball sailed gracefully over the defensive wall, it found the head of Dwayne Sweet who put it securely into the net. Fifteen minutes later, Lee Marshall rattled the visitors’ crossbar from another free kick and it seemed there was a pattern to events emerging. However, this was not to be and although both goalkeepers were given chances to earn their keep, no further marks went on the scorecard before the break. The second half produced no great excitement until, with just seven minutes left to play, Coningsby’s Jack O’Brien launched a hard shot from the edge of the penalty area and watched it go into the bottom corner of the net. Coningsby’s Dwayne Sweet is pictured finding himself on the receiving end of unwelcome attention during the game with Skegness Town Reserves. Photo by Oscarpix Imaging.